Of all musicians, none suffers in his task like the piano accompanist! A good accompanist (like a good mother) has to possess all the qualities of an angel -- and some -- to be efficient, and his training has necessarily to be varied and of long duration. Admittedly there are accompanists who ought to be licensed for specific functions only, but, those excepting, there is a wealth of service provided by these oft-anonymous musicians, hence the purpose of this article which is related primarily to solo accompaniment. The term "accompaniment" usually implies subordination to a principal part; the accompanist thus provides a background and "frame" for the "pictures in music" played by the principal performer(s). Without a suitable background and frame the most beautiful paintings can lose some of their appeal (conversely a good background and frame can enhance the least artistic of pictures!) and a musical parallel to this statement is obvious. Basically accompaniment is partnership, whether equal partnership as in sonata performance or as a secondary part for a soloist or ensemble, and team work counts. Gerald Moore pointedly remarks in his book The Unashamed Accompanist that accompanists should not be regarded as "mere accessories"; they are artists in their own right and should be treated accordingly. It is surprising how few soloists really give any serious consideration to accompanists and their problems. Some soloists never bother to check piano pitch before an engagement (happily this difficulty will, with change to Low Pitch, be almost entirely removed for brass players) and they cheerfully expect accompanists to transpose if pitch difference is discovered! Tuning brass instruments to a piano is not easy and the onus for this is frequently thrust upon the pianist. Circumstances do not always permit full rehearsal before public performance; it is therefore necessary to give the accompanist indications of tempi, mood, etc., well before entry on stage so as to provide for as near unity of idea as possible; hurried last-minute directions do not always help towards inspired music performance, indeed they can be off-putting for listeners and they spoil "communication." Certain accompanists prefer to page-turn themselves whereas others like assistance, particularly if the music is fast and involved, and this is another matter to be decided in soloists' preliminary arrangements. One of the most painful sides of accompanists' duties (especially where brass instrumentalists are concerned) is the expectation that they shall play from torn music; some copies used in concerts and solo contests I have attended would be rejected by any self-respecting fishmonger for fish-wrapping purposes, so tattered their condition! I remember playing in a series of concerts with a soloist who seemed to take fiendish delight in positioning a "quartered" manuscript before the accompanist at each performance with the whispered remark, "I guess this copy is almost finished now,, When music repairs can be effected easily with transparent tape, for example, such incidents are inexcusable. Nervousness, from which probably all musicians suffer to a greater or lesser degree, is something that is highly infectious! Just as a good accompanist will hide any inner misgivings, so also should people requiring his services hide theirs or, as a famous conductor once told a young orchestra: "Try to apply your nervousness to good effect -- it can give sparkle and freshness to your playing and make it different from that so ?professional', cold approach widely apparent today." Balance is essential in all forms of music-making and a light-toned soloist may have difficulties when accompanied by a heavy-toned pianist; the reverse also applies. Clearly the "give and take" idea must operate and adaptability is not necessarily for the accompanist only! Acoustics may adversely affect balance, particularly where brass players are concerned, and soloists should be sensitive to this hazard. To achieve good balance it is imperative to listen to each other and intelligent piano positioning (also piano lid operation) and position of the soloist in relation to the piano and audience can help. Showmanship is sometimes a nauseating feature at concerts and more so when it is given at the expense of the accompanist in a spirit of "one-up-manship." The addition (or elongation) of cadenzas and any other deviations from the copy should be clearly indicated to the accompanist beforehand so that he knows what is intended, even if it does not materialize! Of course, some showmanship may be appropriate and even help folk suffering from exceptional nervousness, but it is better for the accent to be on musicianship which is more substantial and worthy of attention. Happiness, tenderness, passion and many other sources of expression are captured and shared by soloist and accompanist in good partnership; neither will seek the other's "fire", for their work is jointly given with respect for each other and the music. Self-subordination, musically and otherwise, is a means towards enlightenment. In the event of a mistake by one party the other will endeavor to correct matters with the minimum of fuss; not a few soloists have been saved by adaptable accompanists who are expert in the art of "musical camouflage" and' fortunately this is so, in both professional and amateur context. One of the worst problems accompanists have occasionally to contend with is the poor condition of pianos which may resemble the now proverbial instruments found in Services' Canteens! Quite apart from out-of-tune-ness, bad action and missing notes it is possible to find pedal-less pianos as the writer once did in a radio studio abroad; in that event the accompanist refused to play (a perfectly reasonable -- and recommended -- decision) and a more suitable piano was quickly located elsewhere. Gerald Moore likens the busy accompanist's life to that of the jockey who will travel all over the country to different racecourses and ride horses he has never seen before. Just as a jockey needs patience and endurance ability so also does an accompanist, moreover the latter is similarly "thrown" and "bruised." It is eminently desirable that soloist and accompanist should "travel" together yet there are often instances when, metaphorically speaking, one walks and the other runs, thus destroying any element of partnership that might have been enjoyed. The advice of an accompanist is, in my experience, frequently more valuable than that from any other source. The art of accompaniment cannot be learned from a textbook or correspondence course and the competent accompanist is, therefore, essentially a practical musician, a person to be valued and respected. 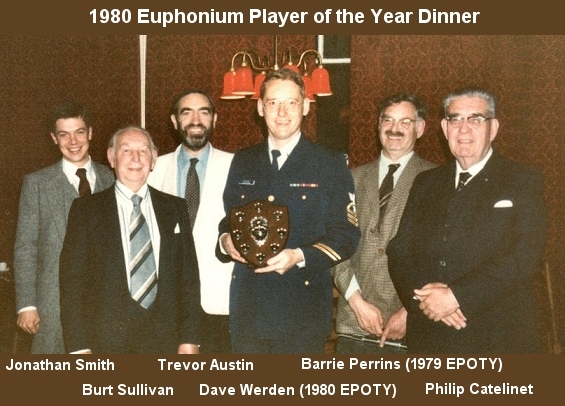 Barrie Perrins is shown in the photo below, which was taken at the Euphoniumists Dinner in 1980, when I was accepting the Euphonium Player of the Year award.